Indian Army Notification is out. Indian Army is recruiting for 100+(Not Specified) Raipur Rally Online Form Posts. You can check Indian Army - Indian Army last date, download Indian Army notification, visit Indian Army official website and check other Indian Army Vacancy details.Complete Vacancy and recruitment Details about 100+(Not Specified) Raipur Rally Online Form vacancies in Indian Army are provided below by JobSarkari.Com only for you. Last Date of Apply Online. 16/05/2019. Date of Admit Card. 18/05/2019 to 31/05/2019. Date of Rally. 01/06/2019 to 10/06/2019. Duty (All Arms). Candidate Must Have Passed Class 10th With Minimum 33% marks in each subject with Overall Aggregate of 45% As Mentioned in Notification. 17 ½ to 21 Years. 168. 50. 77/88. Soldier General Duty (ST). Candidate Must Have Passed Class 10th With Minimum 33% marks in each subject with Overall Aggregate of 45% As Mentioned in Notification. 17 ½ to 21 Years. 162. 48. 77/82. and 50% marks in overall aggregate. 17 ½ to 23 Years. 167. 50. 76/81. and 50% marks in overall aggregate. 17 ½ to 23 Years. 167. 50. 77/82. Soldier Clerk/ Store Keeper Technical. Candidate Must Have Passed 12th Class Securing 50% marks in each subject and 60% marks in aggregate. 17 ½ to 23 Years. 162. 50. 77/82. Soldier Tradesman (10th Pass). Candidate Must Have passed Class 10th And having 33% marks in Each Subject. 17 ½ to 23 Years. 168. 48. 76/81. Soldier Tradesman (8th Pass). Candidate Must Have Passed Class 8th And Having 33% in Each Subject. 17 ½ to 23 Years. 168. 48 77/81. 1.6 Kms Group-I - 05 Minutes 30 Seconds. 6. Upload the Scanned Copy of Documents in the Prescribed Size and Format as mention in the Application form. 7. Online Application can be Submitted on or Before 16th May 2019. 8 Candidate Need to Go On Given Address For Rally on 01st June 2019 to 10th June 2019. Q. 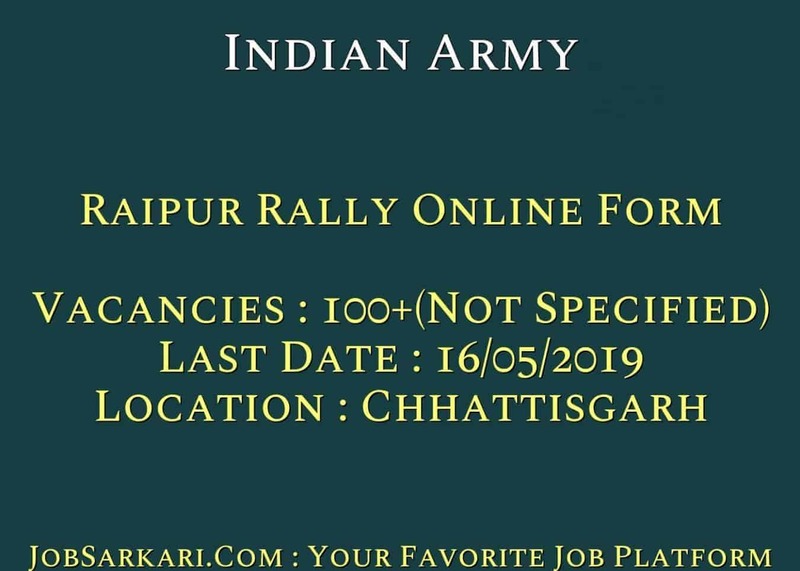 What is the Last Date For Indian Army Raipur Rally Online Form Vacancy ? A. 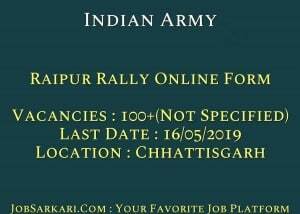 Last Date for Indian Army Raipur Rally Online Form Posts is 16/05/2019. Q. What is the Form Type of Indian Army Raipur Rally Online Form Recruitment ? A. The Form Type for Indian Army Raipur Rally Online Form Posts is Online. Q. How many vacancies are available in Indian Army Raipur Rally Online Form Posts ? A. There are about 0 Vacancies in Indian Army Raipur Rally Online Form Posts. i need this job please help me. hello, How Can We help you Regarding Indian Army Recruitment 2018 Uttar Pradesh Rally Online Form. SIR HARYANA SE BHI APPLY KAR SAKTE H KYA . Hi Praveen, Unfortunately Candidates of Haryana Can Not Apply for Indian Army Recruitment 2018 Uttar Pradesh Rally Online Form. For More Details Please Go Through Notification of this Vacancy on Jobsarkari.com. sir my dream is to join indian army. this is my Only dream. now what is the prodecure to apply ?? in indian army ??….. You Can Click on Registration Link As Given on Our Website in Important Link Section After that U Have to go for rally on given address.